It was seven months ago that Mohammed Bouazizi, a vegetable peddler in Tunisia set himself and the Arab world on fire. The 26-year-old staged his suicidal protest on the steps of the local city hall after a municipal inspector took away his unlicensed vegetable cart thus denying him the ability to feed his family of eight. Most depictions of the Arab revolutions that followed his act have cast them as struggles for freedom and good government. These depictions miss the main cause of these political upheavals. No doubt millions of Arabs are upset about the freedom deficit in Arab lands. But the fact is that economics has played a decisive role in all of them. In Bouzizi’s case, his self-immolation was provoked by economic desperation. And if current trends continue, the revolutionary ferment we have seen so far is only the tip of the iceberg. Moreover, the political whirlwind will not be contained in the Middle East. Most of the news coming out about Egypt today emanates from Cairo’s Tahrir Square. There the protesters continue to demand ousted president Hosni Mubarak’s head on a platter alongside the skulls of his sons, business associates, advisors and everyone else who prospered under his rule. While the supposedly liberal democratic protesters’ swift descent into bloodlust is no doubt worth noting, the main reason these protesters continue to gain so much international attention is because they are easy to find. A reporter looking for a story’s failsafe option is to mosey on over to the square and put a microphone into the crowd. But while easily accesible, the action at Tahrir Square is not Egypt’s most important story. The most important, strategically consequential story is that Egypt is rapidly going broke. By the end of the year, the military dictatorship will likely not only default on Egypt’s loans. Field Marshal Tantawi and his deputies will almost certainly be unable to feed the Egyptian people. Among Egypt’s population of 80 million, some 32 million are illiterate. They engage in subsistence farming that is too inefficient to support them. Egypt needs to import half of its food from abroad. Since Mubarak was overthrown in February, Egypt’s foreign currency reserves have plummeted from $36bn to $25-28bn. Last month Tantawi rejected an IMF loan offer of $3bn. claiming he would not accept any conditions on the loans. Instead he accepted $4bn in loans from Saudi Arabia and another $2.34bn from the Gulf States. What this means is that in a few short months, Egypt will be unable to pay for its imports. And consequently, it will be unable to feed its people. EGYPT IS far from alone. Take Syria. There too, capital is fleeing the country as the government rushes to quell the mass anti-regime protests. Just as Egyptian and Tunisian protesters hoped that a new regime would bring them more freedom, so the mass protests sweeping Syria owe in part to politics. But like the situation in Egypt and Tunisia, Syria’s economic woes are dictating much of what is happening on the ground and will continue to do so for the foreseeable future. Last month Syrian President Bashar Assad gave a speech warning of “weakness or collapse of the Syrian economy.” As a report last month by Reuters explained, the immediate impact of Assad’s speech was capital flight and the devaluation of the Syrian pound by eight percent. In response to the mass protests threatening his regime, Assad has effectively ended his experiment with the free market. He fired his government minister in charge of the economic reforms and put all the projects on hold. Instead, according to a report this week in Syria Today, the government has steeply increased public sector wages and offered 100,000 temporary workers full-time contracts. The Syrian government also announced a 25% cut in the price of diesel fuel at a cost for the government of $527 million per year. Boasting foreign currency reserves of $18bn, the Syrian regime announced it would be using these reserves to pay for the increased governmental outlays. But as Reuters reported, the government has been forced to spend $70-80 million a week to buck up the local currency. So between protecting the Syrian pound and paying for political loyalty, the Assad regime is quickly drying up Syria’s treasury. In the event the regime is overthrown, a successor regime will face the sure prospect of economic collapse much as the Egyptian regime does. And in the event that Assad remains in power, he will continue to reap the economic whirlwind of what he has sown in the form of political instability and violence. What this means is that we can expect continued political turmoil in both countries as they are consumed by debt and tens of millions of people face the prospect of starvation. This political turmoil can be expected to give rise to dangerous if unknowable military developments. POOR ARAB nations like Egypt and Syria are far from the only ones facing economic disaster. The $3bn loan the IMF offered Egypt may be among the last loans of that magnitude the IMF is able to offer because quite simply, European loaners are themselves staring into the economic abyss. Greece’s debt crisis is not a local problem. It now appears increasingly likely that the EU is going to have to accept Greece defaulting on at least part of its debt. And the ramifications of Greek default on the European and US banking systems are largely unknowable. This is the case because as Megan McArdle at The Atlantic wrote this week, the amount of Greek debt held by European and US banks is difficult to assess. sis will only intensify in the wake of a Greek default. Debt pressure on Italy, Ireland, Spain and Portugal which are all also on the brink of defaulting on their debts will grow. Italy is Europe’s fourth largest economy. Its debt is about the size of Germany’s debt. If Italy goes into default, the implications for the European and US banking systems – and their economies generally — will be devastating. The current debt-ceiling negotiations between US President Barack Obama and the Republican Congressional leadership have made it apparent that Obama is ideologically committed to increasing government spending and taxes in the face of a weak economy. If Obama is reelected next year, the dire implications of four more years of his economic policies for the US and global economies cannot be overstated. DUE TO the economic policies implemented by Prime Minister Binyamin Netanyahu since his first tenure as prime minister in 1996, in the face of this economic disaster, Israel is likely to find itself in the unlikely position of standing along China and India as among the only stable, growing economies in the world. Israel’s banking sector is largely unexposed to European debt. Israel’s gross external debt is 44 percent of GDP. This compares well not only to European debt levels of well over 100 percent of GDP but to the US debt level which stands at 98 percent of GDP. Assuming the government does not bend to populist pressure and take economically hazardous steps like reducing the work week to four days, Israel’s economy is likely to remain one of the country’s most valuable strategic assets. 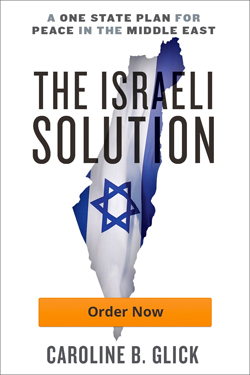 Just as economic prosperity allowed Israel to absorb the cost of the Second Lebanon War with barely a hiccup, so Israel’s continued economic growth will play a key role in protecting it from the economically induced political upheavals likely to ensue throughout much of the Arab world and Europe. Aside from remaining economically responsible, as Israel approaches the coming storms it is important for it to act with utmost caution politically. It must adopt policies that provide it with the most maneuver room and the greatest deterrent force. First and foremost, this means that it is imperative that Israel not commit itself to any agreements with any Arab regime. In 1977 the Camp David Agreement with then Egyptian president Anwar Sadat in which Israel surrendered the strategically invaluable Sinai for a peace treaty seemed like a reasonable gamble. In 2011, a similar agreement with Assad or with the Palestinian Authority, (whose budget is largely financed from international aid), would be the height of strategic insanity. Beyond that, with the rising double specter of Egyptian economic collapse and the rise of the Muslim Brotherhood to power, Israel must prepare for the prospect of war with Egypt. Recently it was reported that IDF Chief of General Staff Lt. Gen. Benny Gantz has opted to spread over several years Israel’s military preparations for a return to hostilities with Egypt. Gantz’s decision reportedly owes to his desire to avoid provoking Egypt with a rapid expansion of the IDF’s order of battle. Gantz’s caution is understandable. But it is unacceptable. Given the escalating threats emanating from Egypt – not the least of which is the expanding security vacuum in the Sinai — Israel must prepare for war now. So too, with the US’s weak economy, Obama’s Muslim Brotherhood friendly foreign policy, and Europe’s history of responding to economic hardship with xenophobia, Israel’s need to develop the means of militarily defending itself from a cascade of emerging threats becomes all the more apparent. The economic storms may pass by Israel. But the political tempests they unleash will reach us. To emerge safely from what is coming, Israel needs to hunker down and prepare for the worst.